At least 13 people have been killed and 25 others wounded in a suicide attack at an election campaign rally in the eastern Nangarhar province in Afghanistan. 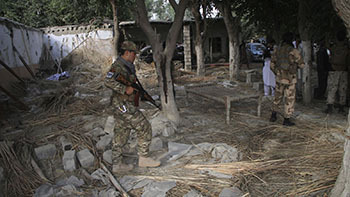 The assailant detonated his explosives on Tuesday at a rally by parliamentary candidate Abdul Nasir Mohmmand in the Kama district outside the provincial capital of Jalalabad, provincial governor spokesman Ataullah Khogyani said. The attack, claimed by the Islamic State of Iraq and the Levant (ISIL, also know as ISIS), came as campaigning began for parliamentary elections due on October 20. "Elders were speaking at the meeting when there was suddenly a huge blast," Sayed Humayoun, who was attending the meeting, said. "I was knocked unconscious but when I opened my eyes there were bodies scattered all around the blast area," he said, adding that he could see dozens of dead and wounded bodies on the ground. Around 250 people were attending the rally, said Sohrab Qaderi, a member of the provincial council. Five candidates have been killed in attacks, according to the Independent Election Commission, and there are fears violence will escalate. The Taliban and the Islamic State of Iraq and the Levant (ISIL, also known as ISIS) group have vowed to disrupt the election process as they ramp up attacks across the country. More than 2,500 candidates will contest the ballot, which is seen as a test run for next year's presidential election. But preparations for the vote have been in turmoil for months. Bureaucratic inefficiency, allegations of fraud and an eleventh-hour pledge for biometric verification of voters threaten to derail the election and any hope of a credible result. The international community is pushing hard for the vote to happen before November's ministerial meeting in Geneva, which the United Nations says is a "crucial moment" for the Afghan government and its foreign partners to demonstrate progress. Some 54,000 members of Afghanistan's security forces will be responsible for protecting more than 5,000 polling centres on election day. More than 2,000 polling centres that were supposed to open will be closed for security reasons. The number of children killed or injured in the Afghan conflict last year climbed to 1,756 -- representing an average of 4.8 child casualties a day and marking a substantial increase over the 1,396 children hurt or killed in the previous year, according to a global report on children and armed conflict.